Share the post "Crataegus or Hawthorn – Species With Medicinal Properties"
Crataegus, commonly known as a Hawthorn, Thornapple, May-tree, Whitethorn, or Hawberry, is a large genus of shrubs and trees in the family Rosaceae, native to temperate regions of the Northern Hemisphere in Europe, Asia and North America. The name “hawthorn” was originally applied to the species native to northern Europe, especially the common hawthorn Crataegus monogyna. The name is now also applied to the entire genus and to the related Asian genus Rhaphiolepis. The name haw, originally an Old English term for hedge, applies to the fruit. Kratos means in Greek “strength” and akis means “sharp”, referring to the thorns of some species. Crataegus species are shrubs or small trees, mostly growing to 5–15 metres (16–49 ft) tall, with small pome fruit and usually thorny branches. The leaves of most species have lobed or serrate margins and are somewhat variable in shape. The fruit, sometimes known as a “haw”, is berry-like but structurally a pome (the word ‘pome’ entered English in the late 14th century, and referred to an apple or an apple-shaped object. It derived from the Old French word ‘pome’ apple (12th century)). Crataegus is a well-known herb in traditional Chinese medicine and is a herb remedy and used in traditional medicine in cultures throughout much of the world, where there is a temperate climate supporting growth of the trees, especially in Europe. The species used in China, Crataegus pinnatifida, differs from that which is relied upon as a source of the Western herb, obtained mainly from Crataegus monogyna, and Crataegus laevigata. Crataegus monogyna is one of the most common species used as the “hawthorn” of traditional herbalism, which is of considerable interest for treating cardiac insufficiency by evidence-based medicine. The plant parts used medicinally are usually sprigs with both leaves and flowers, or alternatively the fruit. 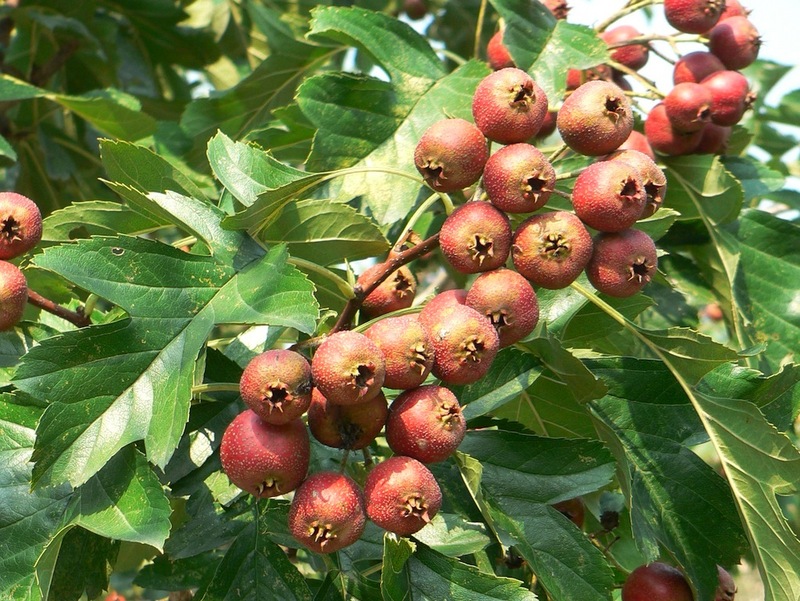 There are evidences that crataegus is an aid to persons with chronic heart failure. It appears to improve the left ventricular function and, as a result, improve exercise capacity and tolerance. In addition, crataegus provides many of the benefits attributed to Chinese herbs that are “blood vitalizers:” reducing blood lipids, improving blood circulation, and alleviating hypertension (via vasodilation). These effects may be attributed primarily to the flavonoids of crataegus. 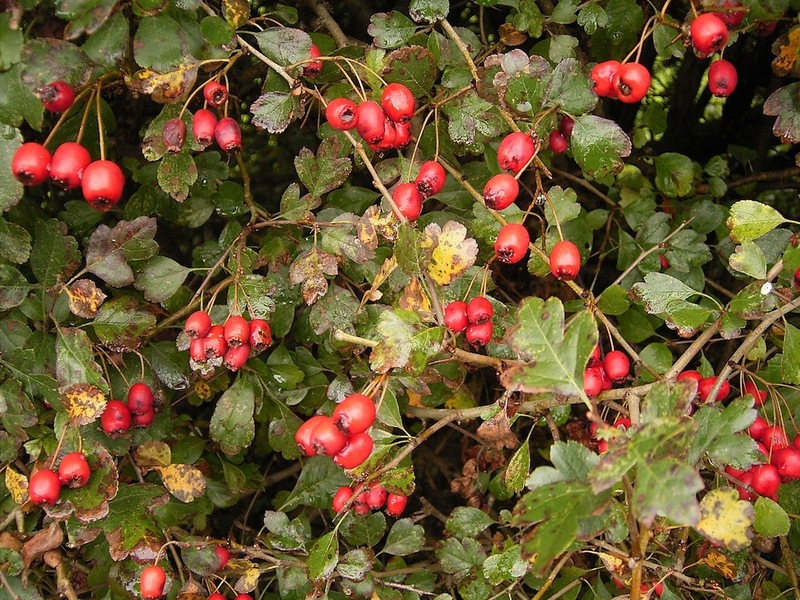 Extracts of hawthorn leaves with flowers is a good source of antioxidant phytochemicals. Crataegus monogyna, known as common hawthorn or single-seeded hawthorn, also may, mayblossom, maythorn, quickthorn, whitethorn, motherdie, and haw, is a species of hawthorn native to Europe, northwest Africa and western Asia. It has been introduced in many other parts of the world, and can be invasive. This species is one of several that have been referred to as Crataegus oxyacantha, a name that has been rejected by the botanical community as too ambiguous. The younger stems bear sharp thorns, approximately 12.5mm (half an inch) long. The leaves are long, obovate and deeply lobed, sometimes almost to the midrib, with the lobes spreading at a wide angle. The upper surface is dark green above and paler underneath. Flowers are moderately fragrant. The “haws” or fruits of the common hawthorn, Crataegus monogyna, are edible but the flavour has been compared to over-ripe apples. They look similar to berries. A haw is small and oblong, similar in size and shape to a small olive or grape, and red when ripe. Crataegus monogyna fruit has only one seed, but in other species of hawthorn there may be up to 5 seeds. In the United Kingdom, they are sometimes used to make a jelly or homemade wine. The leaves are edible and, if picked in spring when still young, are tender enough to be used in salads. The young leaves, flower buds, and petals, which are also edible, are known as “bread and cheese” in rural England. The common hawthorn is distinguished from the related but less widespread Midland hawthorn (Crataegus laevigata) by its more upright growth, the leaves being deeply lobed, with spreading lobes, and in the flowers having just one style, not two or three. However they are inter-fertile and hybrids occur frequently; they are only entirely distinct in their more typical forms. Crataegus laevigata, known as the midland hawthorn, English hawthorn, woodland hawthorn or mayflower, is a species of hawthorn native to western and central Europe, from Great Britain (where it is uncommon, and largely confined to the Midlands) and Spain east to the Czech Republic and Hungary. It’s also present in North Africa. It is distinguished from the related common hawthorn, Crataegus monogyna, in the leaves being only shallowly lobed, with forward-pointing lobes, and in the flowers having more than one style. However hybrids occur frequently. Crataegus laevigata is also used in herbal medicine where the plant is believed to strengthen cardiovascular function. A closely related species, Crataegus cuneata (Japanese hawthorn) is used in a similar manner. In ancient times, the Chinese herbalists mainly used dried fruits of Crataegus pinnatifida (shanzha) to improve digestion. The reputation of crataegus is that it promotes the digestion of meat and fatty foods. The presumed mechanism of action is to stimulate the production or activities of enzymes (such as proteases and lipases) that digest these food substances and/or stimulate production of bile, which especially assists the digestion of fats. The fruit contains small amounts of lipase and one of the fruit constituents, crataegolic acid, is reported to increase the activity of proteolytic enzymes. However, it is unclear whether there is sufficient content of these compounds to significantly enhance digestion of fats and proteins and the mechanism of action may rely on other active ingredients. For the past thirty years, Western applications of crataegus have been verified by Chinese researchers and added to its list of applications in Chinese medicine. Numerous Chinese formulations now incorporate the herb for strengthening heart function, lowering blood lipids, and dilating blood vessels to promote blood circulation. The Kutenai people of northwestern North America used black hawthorn fruit for food, and red hawthorn fruit in traditional medicine. 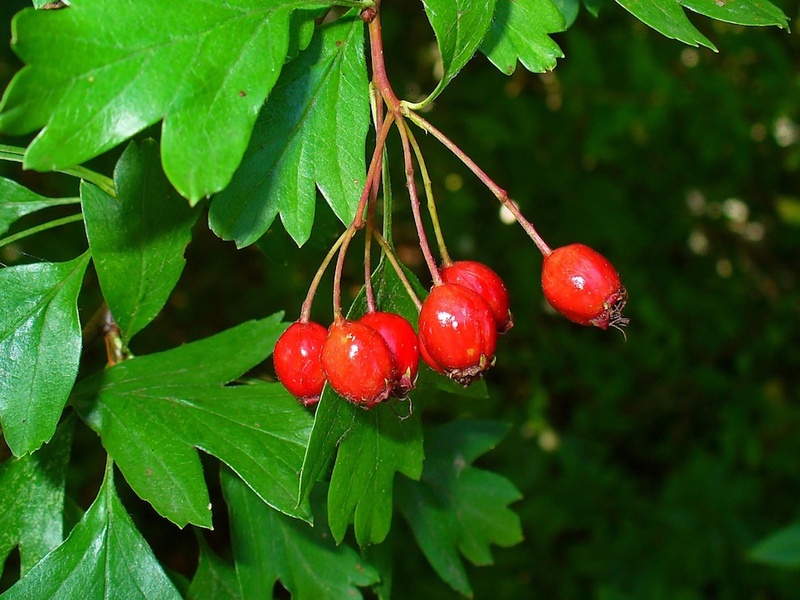 If you are pregnant or breastfeeding, if you have low blood pressure, DON’T use the hawthorn! Also, everyone should be careful, as overdose of crataegus can cause cardiac arrhythmia and dangerously low blood pressure. Milder side effects include nausea and sedation. Patients taking digoxin should avoid taking hawthorn. Do you grow Crataegus (Hawthorn) in your garden? What is your experience with this plant? Please share with other fellow gardeners in the comments below! Do you sell Crataegus (Hawthorn) seeds, plants or have products made with hawthorn for sale? You can place your advertisement here. Contact us now!